November 2, 2018 11:24 A.M.
SARNIA — Premier Doug Ford today announced how Ontario's Government for the People is working to make the province open for business, grow the economy and help create good jobs. "Ontario is open for business and we want everyone to know it," said Ford. "Signs that say 'Ontario is Open for Business' will soon go up at border crossings across our province." 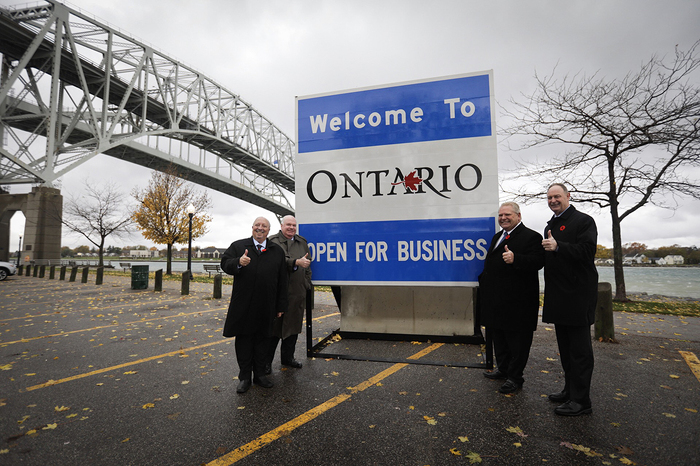 Fulfilling an election promise, Premier Ford, accompanied by John Yakabuski, Minister of Transportation, Jim Wilson, Minister of Economic Development, Job Creation and Trade, and Bob Bailey, MPP for Sarnia-Lambton, unveiled a sign that declares that Ontario is "Open for Business." 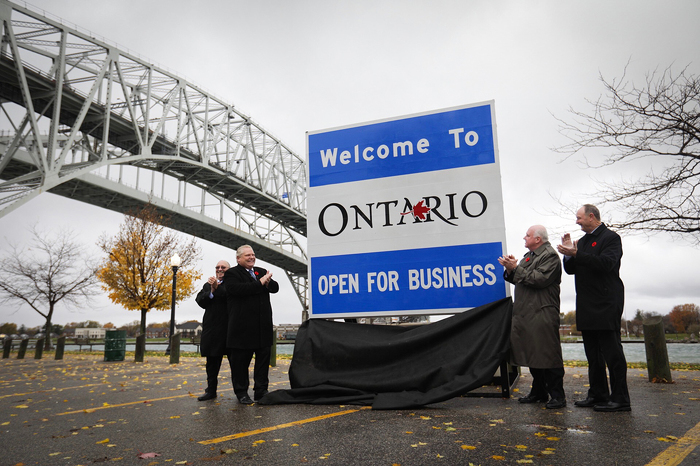 The sign, one of a series that will be unveiled near land border crossings throughout the province, will send a clear message to the world that Ontario is a business-friendly province, and can once again be the economic engine of Canada. 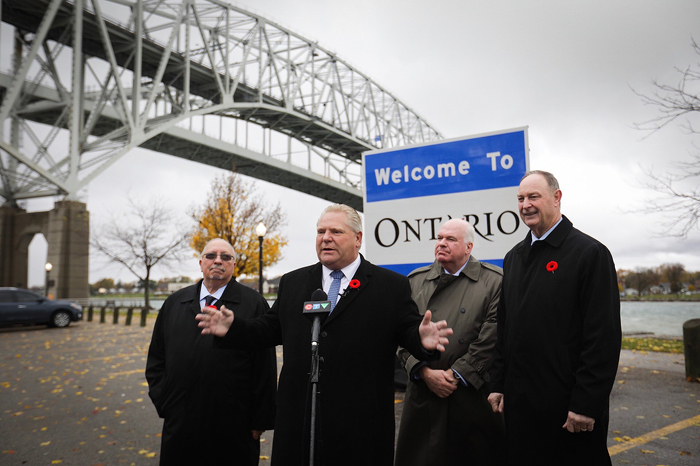 "Businesses tell us that job growth starts with cutting the burdensome, job-killing red tape that drives investment and jobs out of Ontario," said Ford, speaking near the Blue Water Bridge, one of Canada's busiest border crossings. "If you're prepared to work, then we believe you deserve a shot at a job." "Our government was elected on a clear mandate - to Open Ontario for Business. For too long, job creators in Ontario have been burdened by excessive red tape," said Wilson. "We're reducing the regulatory burden on job creators so they can thrive, remain competitive and create jobs. Ontario is open for business." "In 2017, over 32 million cars and trucks used Ontario's international border crossings," said Yakabuski. "The signs are a great way to show everyone entering the province that we're committed to attracting business and investment, boosting prosperity and creating jobs for the people of Ontario." Premier Ford also highlighted how the government's proposed Making Ontario Open for Business Act will, if passed, make it easier for Ontario employers to hire, and will ensure workers have easier access to jobs and career growth. The act, if passed, will eliminate job-killing regulations that are inefficient, inflexible and out-of-date, while at the same time maintaining standards to keep Ontarians safe and healthy. It will include steps to modernize and transform Ontario's skilled trades and apprenticeship system, making it easier for employers to keep up in training the skilled tradespeople that will be demanded by Ontario's economy. The act would also remove the worst burdens that prevent Ontario businesses from creating jobs, imposed by the previous government's Bill 148, to help create more jobs and expand opportunities for workers. "We want to make it easy for businesses to invest in Ontario. That means keeping regulations that work and make sense for Ontarians, and getting rid of ones that don't," said Ford. "Our government has been clear since day one — we are making Ontario open for business. We will bring quality jobs back to Ontario and help all families get ahead."